Be the first to share your favorite memory, photo or story of Sidney . This memorial page is dedicated for family, friends and future generations to celebrate the life of their loved one. VAN LEER – Sidney Sellers Van Leer, 93, of Old Colebrook Rd., died unexpectedly on Tuesday, September 25, 2018. He was the husband of Arlene M. (Hein) Van Leer for 27 years. Born February 7, 1925 in Philadelphia, PA; the son of the late Joseph W. and Charlotte B. (Dubbs) Van Leer. His Military service in World War II, was served “with distinction” as a member of the U.S. Navel Armed Guard Gun Crew Unit, assigned to protect merchant vessels in combat situations in the European Theater of Operations. 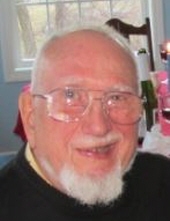 A 1949 graduate of Spring Garden College in PA, his career as Electronic Engineer led him thru computer, missile and space positions for 40 years. Prior to his retirement in 1990, he coordinated radio and television communication test elements of the Space Shuttle for Rockwell Internations, Inc., (now Boeing Corp.) the prime NASA contractor for design and development of the shuttle, in Downey, CA. He was involved in all successful space flights after the Challenger accident. Before retiring, he studied for the ministry and was ultimately licensed and ordained by the Full Gospel Tabernacle in CA., where he served as Outreach Pastor and conducted services in convalescent homes and prisons. Locally, he acted as assistant to pastors of two churches in Winsted and served as Treasurer of one of the churches for awhile as well as conducting services at a local rest home. He was also a member of the Greater Winsted Area Ministerial Association. Sidney was a vocalist and sang in area coffee houses, the Boars Head Festival for 2 years and guest soloist for the Farmington Valley Christian Women’s Club. He also sang for Christian Fellowship Center in Bristol, where he was a member and served in a variety of assignments. He directed a local chapter of the internationally known “Christian Men’s Network” for several years and produced their program on local public access TV. He was an active member of the Full Gospel Businessmen’s Fellowship International, the Fellowship of Companies for Christ International, former member of Promisekeepers and current member of Christian Coalition. Other local organizations that he was associated with were the Colebrook Historical Society, the Colebrook Associates, Senior Centers in Colebrook (where he served as member of the Board of Advisors), McCarthy Senior Center in Winsted (where he sang with the Senior chorus in convalescent home appearances), the Sullivan Senior Center in Torrington, member of the Veterans of Foreign Wars (where he served as Public Relations Officer), American Legion Post #27 in Litchfield, former member of the Elks Lodge in Torrington and former member of the Academy of American Poets in New York. Sid served as Representative for the Town of Colebrook on the Northwestern Regional Advisory Board to Pegasus Cable TV, the Mad River Public Access TV Board of Directors, was a Colebrook Democratic Town Committeeman and Treasurer, a Colebrook Justice of the Peace and a Colebrook Deputy Voters Registrar. He produced, directed and served as Master of Ceremonies for the first Senior Citizen Poetry contest ever held on public TV in Winsted. He was also active in the Code Blue and Winsted Health Organizations in their attempt to restore Winsted Memorial Hospital. In addition to his wife, he is survived by a son, Eric Van Leer and his wife Jerilyn; daughter, Joyce Koller and husband Robert; step children, Ronald Cormier, Sherri Savanella, Darlene Cormier and Dean Cormier; grandchildren, Meredith Whiting and Justin Van Leer; step grandchildren, Danielle Robade, Jacob and Alex Savanella and Gianna Masucci; great grandchildren, Isabella Whiting and William Whiting; and several nieces and nephews. Sidney was predeceased by his first wife, Nancy M. (Amato) Van Leer; a daughter, Lori S. Holloway; and four brothers, Randolph Justice Van Leer, George R. Van Leer, Joseph Wayne Van Leer and Bernard W. Van Leer. Friends may call on Sunday, September 30, 2018 at Montano-Shea Funeral Home, 922 Main Street, Winsted from 3 – 5 with a funeral service at 5 PM. Graveside services will be held on Monday, October 1, 2018 at Forest View Cemetery, Winsted with full Military Honors at 11 AM. In lieu of flowers, memorial donations may be made to: American Legion Veteran of Foreign Wars. Visit an online guestbook at Montano-shea.com. To plant a tree in memory of Sidney Sellers Van Leer, please visit our Tribute Store. "Email Address" would like to share the life celebration of Sidney Sellers Van Leer. Click on the "link" to go to share a favorite memory or leave a condolence message for the family.